Couples with children who decide to divorce face many challenges as they transition to being single parents. Trying to explain that everyone does not live together anymore is a hard concept for young children to grasp. In addition to losing the family unit, children can find themselves disconnected from family and friends as parents adjust school and living arrangements. One family member that is typically very important to a child’s wellbeing and development is a grandparent. Grandparents hold a special place in a child’s life that is difficult, if not impossible, to replace. However, depending on the circumstances of a divorce, a parent may decide it best to limit or deny a grandparent access to a child. This decision can be devastating for the child and grandparent alike, and Florida law recognizes that visitation with a grandparent should be extended some degree of protection. 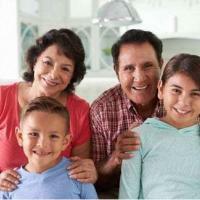 A number of states have laws on grandparent visitation that vary on how extensive the grandparent’s right to see a child is. A woman from Illinois was recently charged with child neglect for violating court-ordered visitation with her daughter’s paternal grandparents. Florida is on the more conservative side when it comes to grandparent visitation rights, and will only grant it under specific circumstances. This stance is reflective of the strong deference given to parents to decide who should have access to their child. one parent is missing, deceased or in a vegetative state, and the other parent has been convicted of a felony or violent crime that shows the parent poses a substantial threat to the child’s health or welfare. Thus, the parents must be unavailable to care for their child, and, in a practical sense, the grandparent offers the closest opportunity possible to learn about the absent parent. As a preliminary step to considering the petition, the court must first determine if the parents are unfit or pose a substantial threat. Unless one of these options is answered in the affirmative, the petition will not proceed for full consideration. In addition to assessment of the parents, the court also looks at what is in the best interests of the child, and whether visitation with the grandparent would damage the parent/child relationship. the child’s preference, if mature enough to make a reasoned decision. the psychological effect of the visitation disputes on the child. If you are struggling with a child visitation dispute, talk to a family law attorney about your rights and obligations. Parents have a lot of leeway to decide who can see their child, outside of the other parent. The All Family Law Group, P.A. helps individuals in the Tampa Bay area resolve a variety of family law issues, including child custody and visitation. Contact the Tampa divorce attorneys and family lawyers at All Family Law Group, P.A. in Tampa Bay at 813-816-2232 for a consultation at no charge or email us.